Kamakura is a small city about an hour south of Tokyo. Nestled between the mountains and the sea, this charming coastal town has long been a popular choice for relaxing day trips and weekend getaways. As a former capital of Japan, Kamakura boasts a remarkable concentration of temples in a small area, including one — Kotoku-in — housing the famous Daibutsu (Great Buddha). With so many historical gems, comparisons to Nara and Kyoto are common. This, more than anything else, is probably what attracts most travelers to Kamakura – and in recent years the number of visitors to Kamakura has increased dramatically. Thanks to the crowds, if you’re not careful you can get the impression that the town increasingly exists to cater primarily to the hordes of tourists descending upon it. Yet there is still much to love about Kamakura. Outside of the peak seasons and main temples and shrines it is, at its heart, a quiet residential seaside town. If you’re looking for a dose of nature, try out some of the hiking trails, which are quite glorious in autumn. While not the best beaches in Japan (that honor goes to pristine Okinawa), Kamakura and its coastal neighbors offers the chance to enjoy some sea and sand (you might even try dabbling in some surfing or kayaking). At night, you’ll find that dinner is a particularly pleasant affair when most everyone has jumped on the train back to Tokyo. Plus, everything tastes better by the ocean. If you want to soak your worries away in a hot spring, you can also visit Inamuragasaki Onsen, located along the adorable Enoden (Enoshima Electric Railway) that runs along the coast. Rather unsurprisingly, Kamakura is also home to many people who have abandoned the rat race for more low-key lifestyles. A receptionist at one of the accommodations I stayed at, for instance, turned out to be an aromatherapist, masseuse, aikido practitioner, and surfer when she wasn’t helping out at the desk. A man I met quit the salaryman life in Tokyo to open up his own curry restaurant (included in the food recommendations below). People running independent coffee shops, galleries, and restaurants in this small coastal town all have their own backstories and side hustles. Not everyone speaks English (of course, the language barrier is part of traveling in Japan) but, more often than not, the friendliness and effort make up for it. If you’re strapped for time, it is possible to “do” Kamakura in one day. But personally I think Kamakura is best enjoyed at a relaxed, leisurely pace. While of course not possible for everyone, consider staying overnight if you can. Spend some time exploring the side streets. Take a walk on the beach. Talk to people. You won’t regret it. Everyone travels to Kamakura to see the Daibutsu at Kotoku-in. The giant copper structure is indeed quite striking, and requires only a nominal sum of JPY 200 to visit. The crowds bring to mind the Leaning Tower of Pisa. Read more about entrance fees & prices in Japan. The other spot most visitors typically tick off the list is Tsurugaoka Hachimangu Shrine, located a short five-minute walk away from Kamakura Station. In reality, this walk takes much longer when you head down Komachi Shopping Street, which runs parallel to the main approach. The approach to the shrine is lined with cherry trees, making for an impressive sight in the spring. Read our full post on visiting Japan in the spring. Hasedera Temple is another popular spot, as evidenced by the shiny ticket machines that help streamline the queues of people. But for just JPY 300, you have a rather sprawling temple to wander around, full of beauty and esoteric little nooks and crannies that bring to mind Miyajima’s Daisho-in temple complex. Instead of taking the Enoden (it’s an easy ride from Kamakura Station to Hase Station), opt to walk. From Kamakura Station, take the west exit and walk down the shopping street. You’ll come out onto a large road. Turning right and walking straight down will, eventually, lead you to Hasedera Temple. Along the way, you’ll pass by a number of charming restaurants and zakka shops selling beautifully designed goods like stationery, postcards, canvas bags, and organic soy sauce. In Hasedera Temple there is a cave with a low ceiling, forcing you to stoop as you walk through; toward the end of the circuit, you’ll discover an eerie little cavern full of tiny figurines of Benzaiten, the goddess of everything that flows. The lower level of the temple grounds is a lovely strolling garden, with carp-filled ponds, bridges, and plum trees. Climb the stairs to the main hall for an expansive view of Kamakura. 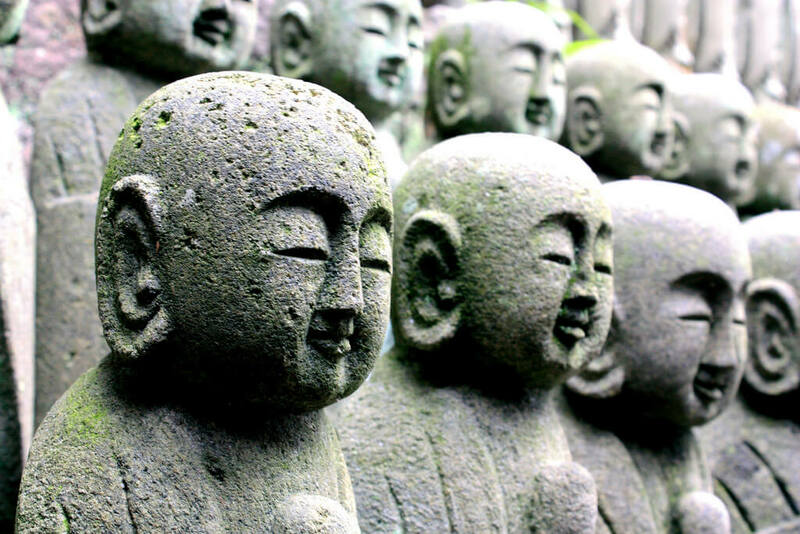 Pause to take in the hundreds of Jizo bodhisattva statues lining the wall on your right. During the rainy reason, the hydrangea “highway” at the highest public reaches of the temple is worth a few more staircases (read all about what to do when it rains in Japan). Kosoku-in Temple is one that far fewer people visit. It is not as immediately photogenic as the other more popular temples, nor does it try to be. You have to walk along some back streets near Hasedera to find it. Entrance is free, though there is a donation box for you to toss a hundred yen in. The gardens are also less regularly manicured, with a few more spiderwebs here and there, and consequently, the temple looks a little wild and shambolic. Somewhere inside the garden, a path breaks off to the side, leading you up the mountain and to a mysterious quarry-like space with a barred-off cave, where we discovered that someone had been imprisoned a long time ago. It’s much more fun than your average temple. In addition to Kosoku-in, the north side of Kamakura also has a few temples worth visiting, like Meigetsuin Temple and Hokokuji Temple. The former is famous for its hydrangea-lined staircase during the rainy season, and the latter has a stunning bamboo grove that’s a favorite with photographers. Kamakura also has a few relatively short hikes that are especially great in the autumn for the colours. These include the Daibutsu Hiking Course, which connects the Great Buddha and Jochi-ji Temple in Kita-Kamakura; and the Tenen Hiking Course, which takes you from the north to the east of the city along the ridges of the hills. Make sure you have sturdy hiking boots, as the paths are unpaved and can be narrow and steep at times. If you love watersports, head to Yuigahama Beach. Not unusually for surfers, the local surf community is a dedicated lot, heading out to catch waves even in the dead of winter. But even if you’re not into surfing, the beach is pleasant to walk along. Kamakura is not really known for a specific regional cuisine, but there is much good eating to be had. Even the uber-trendy Dandelion Chocolate has a shop Kamakura! In addition to all varieties of Japanese cuisine, there are also a surprising number of Italian spots, pizza shops, and burger joints around town. Check out the oddly pub-like Milk Hall, which serves Western-style yoshoku dishes. Find more foods to eat when you visit Japan. Walking from Kamakura Station to Hasedera Temple will take you past a number of good restaurants. Ichikanjin, for instance, serves some seriously fabulous ramen (read more about ramen in Japan). They close when the soup runs out, so it’s usually best to go for lunch. For a lighter noodle option, the soba at Kamakura Matsubara-an is very highly regarded. Then there’s Gokuraku Curry, owned by a quirky, if slightly eccentric, chap — his personality shines through in the illustrations (all hand-drawn) at his shop. He serves a Japanese-Indian chicken curry with more than a strong hint of coriander, and sells only 30 bowls a day. Count yourself lucky if you can get there early enough. Along the road between Kotoku-in and Hasedera you’ll find a small food truck selling jakoyaki, their take on takoyaki. Whereas takoyaki are hot, molten balls of batter with pieces of octopus within (read more about takoyaki and other Osaka specialties), jakoyaki are instead filled with jako, soy-flavoured baby fish. The pun is slightly groan-inducing, but they’re tasty enough and worth a try. Shirasu-don (whitebait rice bowls) are a popular option for lunch. More adventurous diners may wish to try raw whitebait when it’s in season — hundreds of tiny, slippery, and lightly salty fish with rice. If venturing farther from the station, there are some restaurants with ocean views by Yuigahama Beach, including an Italian beach bar and another Japanese curry restaurant. As for coffee, Kannon Coffee (near Hasedera) serves an excellent cup of coffee. Check out more great coffee shops in Japan. Most places in Kamakura tend to be closed on Mondays and Tuesdays. On weekends, many restaurants can be booked solid for the evening. If you’re staying overnight in Kamakura farther away from the station, make sure you book a place for dinner or have some backup options. As with many travel hotspots in Japan, Kamakura tends to be congested during peak months like March and April, and October and November. The autumn colours are particularly popular, so if you don’t necessarily have your heart set on those, plan on traveling during off-peak months. Dig deeper in our article, When is the best time of year to visit Japan? Each season brings different things to delight in. For instance, Tsurugaoka Hachimangu has a gorgeous display of peonies in February that most people skip, probably because of the additional JPY 500 entrance fee. But it is entirely worth the nominal fee to wander through a garden full of romantically named peonies — think varieties like Koukijishi (Red Shining Lion), Taiyo (Sunshine), and Yoshinokawa (Yoshino River) — in shades of cream, pink, and bloodstained fuchsia. The rainy season is also a fantastic time to visit. Kamakura is home to several temples famous for their hydrangeas, which bloom at this moist time of year. Not unexpectedly, the hydrangeas also draw crowds of visitors, so plan on an early morning weekday visit. See why the rainy season — and rainy days — are great in Japan! Or simply go on a truly rainy day, when there might be fewer visitors overall. The rain also brings out the vibrant colours of the hydrangeas during tsuyu, and the greenery at all the temples generally. I once visited Kamakura with a typhoon on the way, and it was, frankly, one of the best times I’ve had here. If you have your heart set on visiting during spring and autumn, just be prepared for more foot traffic, and factor in plenty of time for traveling between places. As noted above, you’ll want to avoid Mondays and Tuesdays if you’re staying overnight. While not universal, many restaurants and shops tend to close on these two days. Getting to Kamakura from Tokyo is very easy by train. Japan Railways (JR) has various options (the Odakyu Railway also connects Kamakura and Tokyo, but with longer travel time). You can take the JR Yokosuka Line from major stations such as Tokyo or Shinagawa (travel time is a bit under an hour). Or hop on the JR Shonan Shinjuku Line from major stations such as Shinjuku or Shibuya (travel time is also roughly an hour). If you have the Japan Rail Pass, the JR journeys will be covered, but even if you don’t they’re super easy (and very inexpensive) tickets to obtain. Bicycles are a fantastic way to explore Kamakura, but if you’re less inclined to travel on two wheels, then taxis and buses will do the trick. Of course, if you’re blessed with time, walking is probably the best way to explore. Put on your most comfortable pair of shoes and stroll on. 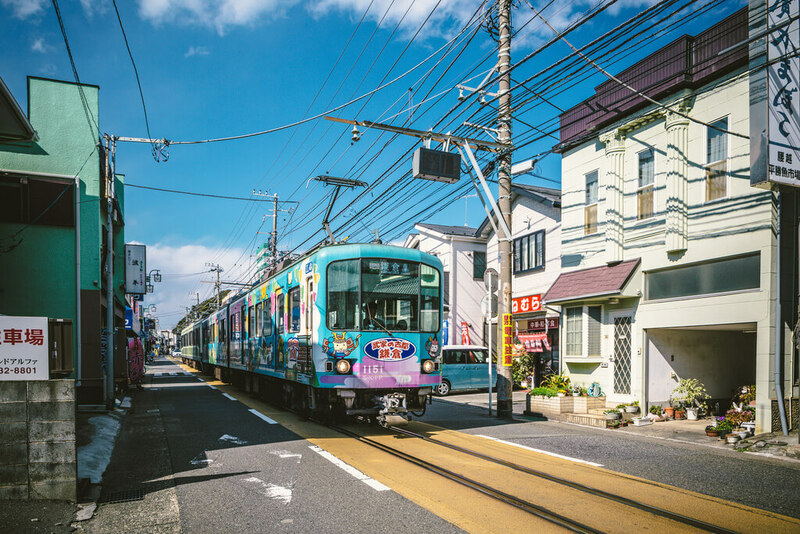 As a side note, train lovers should not miss the charming Enoden, which connects Kamakura with nearby Enoshima Island. Sadly, one reason most travelers don’t spend the night in Kamakura is the relative lack of accommodation options. While there are a fair number of informal Japanese-style guesthouses (minshuku), and some ryokans as well, Kamakura is not blessed with remarkable accommodations. Regardless, there are some decent hotels here, and apart from Kamakura itself it’s worth considering nearby places up and down the Shonan coast, such as Enoshima and Zushi, which can be quite pleasant and offer easy access to Kamakura.